It might seem alien at first, but there's little need to be sceptical: the Mi Mix 2 wraps all the home comforts of an Android flagship in an altogether more affordable device, without compromising the design. It's a great sign of the future to come from this maker. It's finally happened: Xiaomi, the affordable Chinese phone brand, has worked its way over to Europe. Well, Spain for the time being. But we've prised a top-spec Mi Mix 2 handset from overseas to see how it holds up in ol' Blighty - which is of particular interest given that, we suspect, the UK will be a future target market. Just because Xiaomi is known for affordability doesn't mean the company takes shortcuts when it comes to design though. The Mi Mix 2 is of particular interest for a number of reasons: it's hugely powerful, yet hugely affordable (at €499, which is about £450 at the time of writing), and brings an ultra-trim bezel design that adds a point of difference compared to other phones on the market. Well, if you ignore the updated Mi Mix 2S, which was announced at a Shanghai launch event in March 2018. All this sounds like a whole dollop of promise for a brand that, for many people, will be seen as somewhat alien. So should you welcome Xiaomi's new arrivals with open arms, or does it warrant some scepticism? We've been using the Mi Mix 2 as our day-to-day phone for a couple of weeks to see how it holds up. Ultra-trim bezel designs aren't new in smartphones, but it was Xiaomi's original Mi Mix that was much to do with kicking-off the trend. That phone didn't make it to Europe officially, of course, so it was widely missed by a large chunk of the globe. Since then we've had the likes of the Samsung Galaxy S8 and the Apple iPhone X capture the headlines - but the Mi Mix 2 looks every bit as good as those, perhaps even better thanks to its consideration with the top bezel. Well, more the lack of such bezel. There's no notch, the trim bezel line keeps the form of the phone neat, while pushing that 5.99-inch screen to the fore. It's a savvy design, as the top edge of the screen is critically important. It's where you swipe down the shade in Android to see notifications, it's where various in-app buttons or settings are most likely to exist, so it's totally logical to have no design distractions around it. 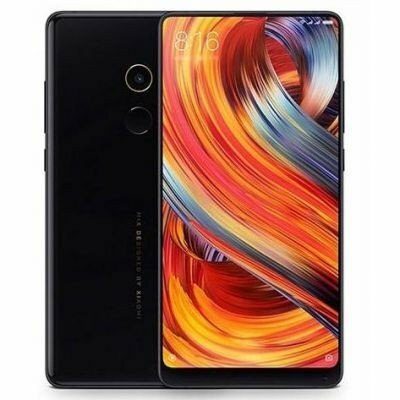 Interestingly, Xiaomi teamed up with French industrial designer Philippe Starck in the creation of the Mi Mix 2 - a designer famed for his use of simple yet effective shapes; of reduction in form in pursuit of better functionality. And given that the Mi Mix 2 is almost entirely screen, we can see how that concept translates. The rear of the Mi Mix 2 is a reflective curved ceramic. Thing is, it ultimately looks and feels like plastic and is a total fingerprint magnet - picking up smears with too much ease. It's easily wiped clean, which is when it looks at its best, but you can't be dabbing it with a cloth every second of the day. Still, such a fingerprint-averse finish is par for the course these days - just look at the Huawei Mate 10 Pro and Apple iPhone X. Like that aforementioned Huawei, the Xiaomi Mi Mix 2 follows suit with a rear-positioned fingerprint scanner - which makes total sense as there's next to zero space on the front of the device for such a scanner to go elsewhere. It's well positioned to easily tap for a rapid unlock. There's no fancy Face ID unlock or the like, but at this price point that's not exactly a major drawback. Since 2017 there's been all kinds of noise about various flagship phone screens. We've had the dull-as-you-like Pixel XL 2 show that OLED isn't always the absolute perfect choice. We've seen a variety of curved-edge panels, too, such as the Samsung Galaxy S9 - which some will see as fussy, but we think it's stunning. And increasingly there's a trend towards skinnier 18:9 ratio panels with less bezel. The Xiaomi takes that last idea to the current maximum. The panel is a 5.99-inch LCD, with 18:9 aspect ratio, so it fits in perfectly among the current elongated flagships such as the LG V30 or iPhone X, and makes for great one-handed hold. There's no dumbing down in resolution or overall visual quality either, as the settings include ways to adjust the colour profile of the display to suit your needs. The one problem we have with the Mi Mix 2's screen is its auto-brightness response, as it'll typically run into being too dim for the sake of conserving power. It's easily adjusted - swipe down in the Android shade, select desired brightness on the sliding scale - but that selection then stays in play, which has seen our retinas blasted with light first thing in the morning, for example. A better judged auto-brightness balance would be an improvement. Otherwise the Mi Mix 2 is mostly as striking as the other current flagships on the market. It's not as bright as an iPhone X by any means, but as the device is half the price we can more than accept that. It's a great screen overall. That suave design is matched with powerful innards, as the Mi Mix 2 sports the Qualcomm Snapdragon 835 platform (the Mix 2S goes with the more recent 845), which boasts among the fastest processor speeds going, paired with 6GB RAM (not the 8GB RAM as found in the Special Edition model that launched in China or, again, the newer 2S). When it comes to running apps, the large amount of RAM and speedy processor make light work of anything you happen to throw at the device. And at this price point, with only the likes of OnePlus on a level playing field, the Mi Mix 2 scores highly. Elsewhere, the Mi Mix 2's huge array of bands - there are 43 in total, which outdoes the competition - means access to a wide range of frequencies for mobile data connectivity. Our review handset is US-sourced, but this hasn't been an issue whatsoever when using our UK-based Three network. If it's speed you want, then it's speed you'll get, right across the board from Wi-Fi to mobile data connectivity - the automatic Wi-Fi connection proved particularly successful in using networks when data wasn't available, and vice versa. As is increasingly the case in modern flagships, the Mi Mix 2 does away with the 3.5mm headphone jack. Instead, you'll need to use the USB-C port for wired listening - and if you don't have such headphones then there's a small converter included in the box, which isn't as heavyweight and problematic as, say, the DAC found in the Razer Phone. That said, we didn't find the Mi Mix 2's audio to sound that great. While that power sounds perfect on paper, not everything is totally effortless in practice. When we first received the Mi Mix 2, its setup process was slightly different to other Android phones. The device wouldn't transfer files over as neatly from Google, while the Phone Clone transfer app requested that 151 of our apps were manually installed, one by one. It was a bit of a slow setup, therefore, but we only had to worry about that the one time. Furthermore, Xiaomi's MIMU software re-skin (over Google's Android 7.1 operating system) isn't always the smoothest going. It's generally fine, but there's not consistent immediacy and smoothness like you'll find in other top-tier phones. Some of the animations seem the tiniest bit longer than stock Android, which adds a different perception to the pace of things. MIMU's intervention with certain staple Android features - the swipe-down shade for settings and notifications being a two-part swipe, for example, a bit like older LG software - doesn't always work to the user's benefit, in our view. Other quirks such as automatic headphones volume adjustment from app alerts, even when the phone is set to fully silent, are really irksome (and we can't find a way to switch this off). That said, a few days into using the Mi Mix 2 and we've found some of its feature specifics to be rather useful. Its per-app permissions dig into the minutiae of their display settings in a really thorough way - so no constant Facebook Messenger floating notifications, for example, unless you specifically grant it permission. Notifications can also be prioritised by importance per app, with unimportant ones sinking to the bottom of your alerts, or being dumped into a separate folder if you'd rather - a feature that stock Android almost has, but not with as many selectable levels. Some of these settings will require tweaking for you to get things setup to your personal preferences, but it's worthwhile playing around. It might be a bit too deep dive for a casual user, as it reminds us of older Huawei EMUI software (which would throttle everything for the sake of battery life - sometimes even when you wouldn't want it to do so). On the battery life front, the Mi Mix 2's 3,400mAh battery is reasonably capacious for a phone of this size - but it's a full 1,000mAh less than the original Mi Mix, which is a shame. The MIMU software goes some way to conserve the Mi Mix 2's battery life where possible, but even so we've not found the phone to have the greatest longevity per charge. Light use has seen us through around 15 hours, so a full day from waking up to going to bed - but only just. Moderate to heavy use has seen us reaching for the plug quicker than we'd like - perhaps because we've been spoiled with the likes of the Huawei Mate 10 Pro and its ultra-long battery life. Still, thanks to the USB-C port and Qualcomm Quick Charge 3.0, quick top-ups at the plug are just that: quick. We've often plugged in for a spare 15 minutes to raise the battery level fast up to the 80 per cent mark. Which, on balance, sees the Mi Mix 2 have enough stamina for daily use. Flip the Mi Mix 2 around and you'll see it has one camera on the rear, not two like so many devices these days - including the Mi Mix 2S, which has gone in hard on the camera front. The Mix 2's single lens, which offers four-axis image stabilisation, is also coated with an 18-carat gold edge. Because, well, why not? The camera app is super prompt to load and shoot - as instantaneous as that in the Huawei Mate 10 Pro when shooting - which is great for capturing images with zero fuss. The app opens in Photo by default, while Video, Beauty, Square, Panorama and Manual modes are available by swiping left and right - which makes reaching Manual mode a little slow if you're seeking full settings adjustment. Without the two lenses, the Mi Mix 2 avoids the depth-mapping for software-applied blurred backgrounds that's become so common in phones these days - think Portrait mode in the iPhone - opting instead for simpler tilt/shift and parallel blur lines (if you want to soften the edges of an image to make it look miniature). We don't find the absence of a Portrait mode to be of any bother, really, because no manufacturer has got it right yet - including, funniliy enough, Xiaomi, as our preliminary testing with the 2S model suggests the Portrait mode is a bit harsh with its blur assessment. And if you just want to spruce things up and smooth out those wrinkles then there's always that Beauty mode. In terms of functionality, the press-to-focus/shoot interface is reasonably fast to focus - although does pulse in and out in lower lighting conditions. It's not as proficient as some of the phase-detection autofocus systems (PDAF) that you'll find in other phones. However, there's zero lag between pressing the screen and a shot being fired, which is great, while a press-and-hold will whirr off a burst of shots. In terms of results, things are rather mixed. We've had some terrible auto white balance results in some interior situations, offset by balanced and vibrant results when shooting outdoors. Low-light results in some more pronounced grain within shots but the sensor that Xiaomi uses in the Mi Mix 2 holds up well. Again, the 2S is a supposed step up in quality thanks to dedicated hardware processing. There's one software oddity: the option to switch on a Device Watermark which marks "shot with Mi Mix 2" to the bottom right corner of every shot. Why this was ever made an actual feature, we have no idea. When it comes to the front-facing camera, its placement is an unavoidable oddity too. Xiaomi claims that by placing the camera on the "chin" of the device it can remove the "forehead" for that ultra-trim bezel surround on the three major sides. Problem is, with the camera that far down the screen, it adds considerably more "chin" to those selfies! Holding it higher or flipping the device upside down can help, but the lens simply isn't wide-angle enough for a front-facing camera, which is a real letdown. Quirky, but not quite right. The Xiaomi Mi Mix 2 is a strikingly designed smartphone for a cut of the price compared to its flagship competitors. In most departments it more than gives them a run for their money, too. It's powerful, that ultra-trim bezel is well considered and gives the device a look like no other, while the 18:9 ratio screen is ideal for one-handed use. It's not faultless though. It falls down in limited battery life (the original Mi Mix was way better), software quirks (they don't break the experience, just don't see it as best going), inconsistent auto-brightness, its back panel feels more like plastic than the ceramic it's actually made from, and that front-facing camera is just weirdly positioned. All of which are minor criticisms in a generally great phone. That said, with the yet cheaper OnePlus 5T available, lack of distribution in wider Europe, and the Mi Mix 2S incoming, Xiaomi has still got its work cut out to see off its near competition. Plus the OnePlus 6 is rumoured to be just around the corner. It might seem alien at first, but there's little need to be sceptical: the Mi Mix 2 wraps all the home comforts of an Android flagship into an altogether more affordable device, without compromising the design. It's a great sign of the future to come from this maker, which you'll find in the even-more-recent Mi Mix 2S if you can wait a little longer. In its sixth generation device, OnePlus is pressing all the right buttons with its affordable yet powerful handset. With an 18:9 ratio screen like the Xiaomi, the OnePlus advantage is that it's available directly in the UK.